Father Joe Arockiasamy has blessed local animals at St. Mary’s Church in Granville for the past seven years. Local churches, this weekend and next, will host ceremonies to bless animals. Each year, millions of pets are blessed by priests to celebrate the feast day (Oct. 4) of Saint Francis of Assisi, patron saint of animals and the environment. St. Francis reportedly loved all of God’s creatures, treating them with kindness and compassion. Many ceremonies include a verbal blessing and administering of holy water. Animals from dogs to birds and horses to rabbits are blessed each year. Pet owners can bring their furry friends to St. Mary’s Church to be blessed on Saturday, Oct. 7 at noon. 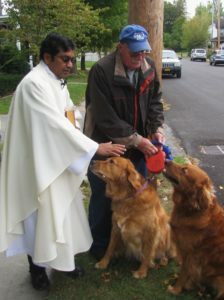 Arockiasamy has blessed local animals at St. Mary’s for the past seven years. About 15 pets are blessed each year. “We encourage everybody to bring them, to experience the grace of God – not just people, animals too,” he said. Blessings, which which consist of a verbal prayer, reading from the scripture and sprinkling of holy water, will take place outside the church at 23 Bulkley Ave. There will be a group photo of owners and their pets after the ceremony. Call St. Mary’s at 518-642-1262 for additional information. St. Raphael’s Catholic Church will bless animals at a ceremony at 9:30 a.m. on Sunday, Oct. 8. Father Lourduraja Simeone said attendees typically bring dogs and cats to be blessed. Larger animals, including horses, are also welcome, he said. “If they are not able to bring the animals, they can bring a picture of their animals … so they can still receive the blessings,” Simeone said. The brief ceremony will include a verbal prayer and holy water. The animals will be blessed together. “We will say a prayer for the animals and for the families who bring the animals, and we will bless them with the holy water,” Simeone said. This is Simeone’s second year as priest of St. Raphael’s and his second year blessing animals in Poultney. Last year, 10 animals were blessed. St. Raphael’s Catholic Church, which has about 200 parishioners, is located at 21 E Main St. in Poultney, Vermont. For more information, call 802-287-5703. This Sunday, Oct. 1, at 4 p.m., St. Paul’s Episcopal Church in Wells will observe the feast of St. Francis by blessing pets and animals. Cider and donuts will be served, and all will be welcome to see the newly-redecorated interior of this historic church, which faces the village green in Wells. All are welcome at this observance. For more information, call Davidson at 518-499-1850 or Warden Timothy Lindgren Haley at 802-645-0679.